So, I kinda missed updating this blog with this score as it was a while back, shortly after the Mid-Missouri Shmup Meet at 48,704,340, with C-S and a (low) max hit of 303. I think at the time I was so close to the second loop, I didn't think to update the blog with this score. I did think enough of it to update the thread on shmups with the score though. I only caught it as I was taking over the DDP high score thread over on Cave-STG and knew my score hadn't been right there for a while. I'm in the process of wiping and reformatting my MAME box as it kinda crapped out on me and then getting back to this bad boy. One of the few games - along with Sky Shark and Castlevania - that I can play anytime and enjoy it. Excellent score! Do you have a proper joystick for MAME- I've been trying to find out info about them. I actually play with a Saturn pad for the PC (USB interface) and I love it. I was playing with a PS2 HRAP stick with an adaptor, but got so use to the Saturn pad, I don't even bother with the stick anymore! I am very jealous! 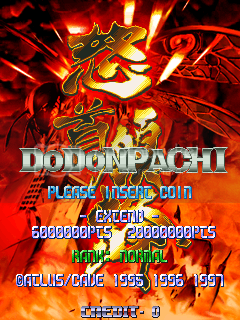 I need to put as much time into this as I did on Raiden Fighters Aces, and see if I can get close to your score! LOL! Good luck, huh? Oh you can do it! I have faith in you! Just play nothing else for like a month and you'll get there.